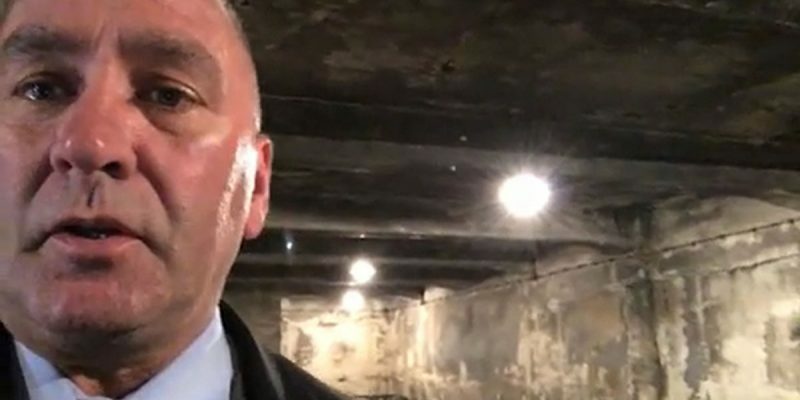 Congressman Clay Higgins released a video, for Independence Day, of his recent visit to the Auschwitz concentration camp in Poland. Many of us would have expected a July 4th video from the YouTube-famous Captain Higgins, filled with fireworks, freedom – pure unbridled ‘Merica. That would have been ok. This video is much more interesting than that. Perhaps to remind us what absolute tyranny looks like, Higgins’ visit to Auschwitz stands in stark contrast to a free America on July 4, 2017. “A great sense of dread comes over you in this place,” says Higgins, as he shows us thousands of shoes left behind by victims of the concentration camp. “The guards would drop Zyklon 5, cyanide gas, from above through hatches,” Higgins laments while standing in a gas chamber. He tells us that 700 Jews were executed at a time, before showing us the furnaces where the bodies were burned. “This is why Homeland Security must be squared away…why our military must be invincible,” says Higgins, who serves on the House Committee on Homeland Security and is also an Army veteran. In America, there has grown a naive group of citizens who have convinced themselves that the world is naturally a peaceful place. These are the same folks that respond to ISIS attacks on little girls with calls for “peace concerts” and a weaker American military. The genocide of the Jews in Europe ended less than 75 years ago. The event is part of modern history, not some ancient act by barbarians. In Syria, right this second, there are poor souls enduring the same sort of unspeakable horrors. Wise Americans understand that there are evil men, plotting and scheming, every hour of the day, to impose this level of tyranny right here in our homeland. Indeed, some of those men are already here. America must always have the greatest military the world has ever seen. We must have the greatest intelligence and we must gain the will, as a people, to do what needs to be done to eradicate every threat. For America, the threats will never cease. On Independence Day, let us remember why we are free.